For a while now I've had this idea for a little layering piece I'd like to knit. I had been planning on doing it in a solid, but then I got the urge to cast on immediately, didn't have enough of the colourway I wanted in stock and would have to dye more. 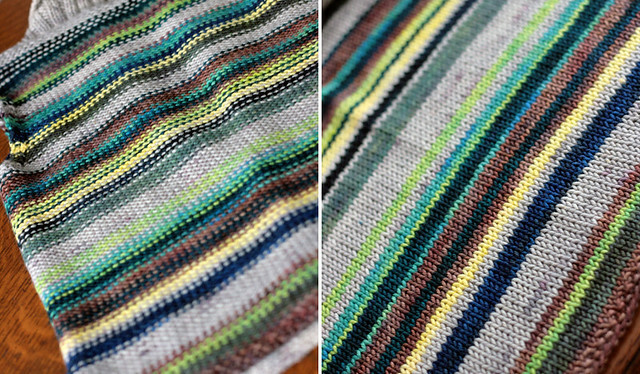 Because I'm impatient and couldn't wait for the yarn to be dyed and dried before casting on, and since this whole thing happened hot off of the heels of my new awesome srappy socks, I decided to do it in stripes! This time I was more deliberate with my choice of colours. I still tried to keep it random-ish, but also balanced. The thing that I always find when knitting gorgeous stripes like this is that the wrong side of the fabric looks just as good as the right side. I'm always tempted to throw a wrench into the whole operation and go ahead and call the inside the outside. This time I actually did it! FO photo's coming soon, as well as the pattern for this "little layering number". I'm obsessed.